After 7 months of an incredibly exciting NBA regular season, we can finally look forward to the 2019 playoffs tipping off on Saturday 12th April. Over the next three months; we’ll see the 16 best teams come together and fight it out for the Larry O’Brien Championship Trophy, with Golden State looking to make it three Championship titles in a row. With Milwaukee Bucks dominating the regular season, will they be the ones to challenge Golden State in the NBA Finals this year? Or will Houston Rockets get one back on Golden State and finally return to the finals as kings of the west? 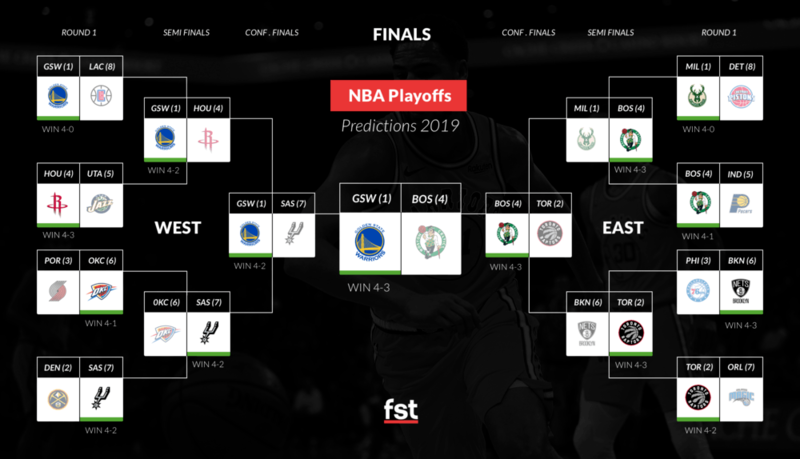 We’ll answer all your questions in our 2019 NBA Playoff predictions! Milwaukee have dominated the regular season to hold the best record in the league with 60 wins and just 22 losses. They face a Detroit Pistons side who sneaked into the eighth seed on the final night of the regular season, Detroit sits with 41 wins and 41 losses this season. Milwaukee have won all four meetings played this season averaging 14.75 points more than Detroit. While Detroit have improved over the past few weeks, Milwaukee will prove to be too strong as they hunt for their first NBA Championship since 1971. Betting Tip: Milwaukee Bucks 4-0 vs Detroit Pistons at 2/1 with bet365. Raptors were next best behind Bucks this season and held the joint third best home record winning 78% of games played in Toronto. They also had the third-best road record in the regular season and played a consistent game throughout the course of the regular season. Orlando went 42-40 in the regular season and finished the season strong with 4 consecutive wins to finish in the 7th seed position. Nikola Vučević has been key for Orlando leading the team in points and rebounds while also being named the only All-Star of the team. This is Magic’s first playoff appearance since 2011 and they will be desperate to keep their form heading into Toronto. The regular season series ended 2 a piece this season with both winning one home and one away game. The key to this series is that Toronto holds the home court advantage where they have remained strong all season, they also have Kawhi Leonard 100% fit with his experience of winning and losing in the NBA Finals. The experience will play to their advantage, while I see Orlando winning a couple, I don’t see them troubling Toronto too much. Betting Tip: Toronto Raptors 4-2 vs Orlando Magic at 7/2 with bet365. This is where things get a little more interesting as Philadelphia hold the home court advantage over Brooklyn. Philly have remained strong on home court with 31 wins and 10 losses this season while averaging 8 points more than their opponents. Their road form hasn’t been their best going 20-21 on the season but the acquisitions of Jimmy Butler, Tobias Harris and Boban Marjanovic has made this team look incredibly strong on paper. Brooklyn have had a surprisingly great season and has caused many upsets which include wins over Boston, Milwaukee, Philadelphia, Indiana & Toronto, all four teams ahead of them in the East. As mentioned, home court advantage sits in Philly’s favour, but, Brooklyn have won once here earlier in the season and will definitely look to take advantage of Joel Embiid who hasn’t been at 100% for a few weeks. There is no doubt Philly are capable of winning this series, but Brooklyn have been resilient this season and have proven they can cause an upset when D’Angelo Russell leads a full strength lineup. If they remain 100% throughout the series, I can see an upset on the cards. Betting Tip: Brooklyn Nets 4-3 vs Philadelphia 76ers at 12/1 with bet365. There is no doubt Boston haven’t been at their best this season but this is something acknowledged by the organisation who vow they can beat any team over 7 games. They finished the regular season with 49 wins and 33 losses, just 6 losses behind last seasons record. Indiana’s season looked to be over when Victor Oladipo suffered a season-ending injury earlier in the year, however, they have remained strong and fought well to grab the 5th seed in the East with 48 wins and 34 losses. The bad thing for Indiana is that their form has been horrific the closer they have gotten to the playoffs. 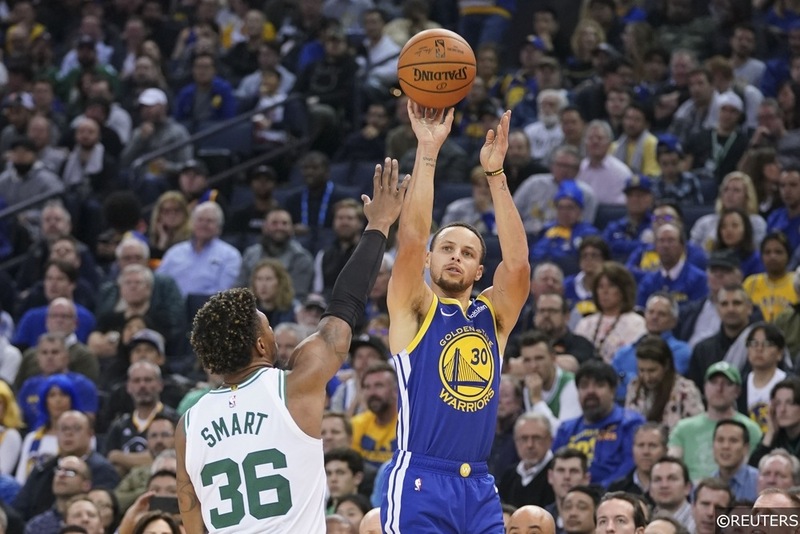 Boston dominated them in just a few nights ago in a game which saw them clinch the all-important home-court advantage. Admittedly, this Indiana side have turned many heads this season but I cannot see Boston taking anything for granted as the post-season begins. They lost in the conference finals last season and they will be desperate to fight their way back to take the Eastern Conference crown. They beat Indiana by 20 points on the road last week and I can only see them getting stronger and stronger. Betting Tip: Boston Celtics 4-1 vs Indiana Pacers 9/4 with bet365. Golden State haven’t looked at their best at certain points this season, but they have the ability to turn up the heat at any given moment and have eased Demarcus Cousins in well since his return from injury. They finished the regular season with 57 wins and 25 losses but they won’t be too worried as they still finished in the top seed. The Clippers grabbed the final seed in the West as they finished on 48-34 in the regular season. They are one of few teams to hold a positive home and road record and have remained consistent no matter the court they play on. The trouble for Los Angeles is that they have lost all four meetings against Golden State this season. Not to say Golden State will take this series lightly, but they will no doubt be looking ahead to the 2nd round with the possibility of Western Conference finals rematch against Houston Rockets. They will want everyone fresh and fit for that series and with a 4-0 record against Clippers already this season, I see them finishing 8-0 after the first round. Betting Tip: Golden State Warriors 4-0 Los Angeles Clippers at 7/5 with bet365. Denver have surprised many to pick up 54 regular season wins and finish in the second seed behind Golden State this season. Nikola Jokic has been the main man leading the team in points, rebounds and assists while also being named a 2019 All-Star. San Antonio didn’t have the best season they’d have hoped for, but they have a real chance of making the finals this season with Demar DeRozan, Lemarcus Aldridge and Rudy Gay all having a great season. For me, the post-season will be much tougher than the seeding suggests for Denver. Both teams won both home court games played against each other this season but not all games were convincing victories. Another series that can honestly go either way but the history of San Antonio and Popovich in the playoffs give them a huge advantage, another ‘upset’ is on the cards for me. Betting Tip: San Antonio Spurs 4-2 vs Denver Nuggets at 6/1 with bet365. In a tightly contested Western Conference, Portland managed to finish in the 3rd seed with just 5 wins separating 3rd and 8th place this season. Portland finished 4 wins better off than last season but have problems heading into the post-season with Jusuf Nurkic suffering a season-ending injury. C.J. McCollum is also battling through injury and will not head into the first round at 100%. Oklahoma have had many ups and downs this season but finished in the 6th seed just one win ahead of the Spurs and Clippers. Paul George is averaging a career high in points, rebounds and assists while Russell Westbrook finished the regular season averaging a triple-double for the third consecutive year. While Portland holds the favoured home court advantage, they have lost all four regular-season games against OKC and will struggle without their best linup on the court. OKC have had a lot of trouble since the All-Star break but I still think they can give Portland a 6th consecutive first-round exit. Betting Tip: Oklahoma City Thunder 4-1 vs Portland Trail Blazers at 11/2 with bet365. It’s been a completely different season we have seen from Houston Rockets as they finished this year with 12 wins less than the previous season. All eyes have been on James Harden who averaged 36.1 points per game this season while also hitting 30+ points in 32 consecutive games this season. Clint Capela has also been vital for Houston this season, averaging over 12 rebounds per game. Utah will be disappointed to finish as low as fifth but will also be glad to have a much stronger lineup than expected as the playoffs begin. They finished with 50 regular season wins this year, winning over 70% played on home court. This is one of the toughest matchups to call for me, Houston have looked more dominant this season but Utah have fought well this season and shouldn’t be easily overlooked. Both have won one home and one away against each other this season but that home court advantage will prove to be a game-changer for Houston. With just 10 losses on this court all season, added to their recent experience in the playoffs, Houston edge this for me. I could have so easily chosen Utah to win this tie but Rockets have the upper hand winning 7 of the last 10 head to head meetings played in Houston while Utah haven’t held a fully fit lineup in recent weeks. Betting Tip: Houston Rockets to win 4-3 vs Utah Jazz at 7/2 with bet365. Although Golden State are incredibly short this season, you cannot overlook them becoming NBA Champions once again. They have something no other team has in this league and have an incredibly strong offensive and defensive lineup. I do not see them losing many games in this post-season, but once they lose one game they will no doubt turn up the heat and take no prisoners. Houston have relied way too heavily on James Harden this season which either Utah or Golden State will find a way to deal with, and they look the best shout to come close to challenging Golden State in the Conference. When it comes to the finals, no current team has any recent experience in the championship games and that will be huge in favour of Golden State. I definitely see it being tougher than last season, but as mentioned they have something no other team in the league has and there is no surprise they are odds on to make it 3 in a row. Boston haven’t had a convincing regular season but their 2018 playoff experience will be crucial to their success this year. They have proven they can beat the top teams with wins over Golden State, Milwaukee and many others and will no doubt be another to turn up the heat in the playoffs. With Milwaukee looking likely to meet Boston in the 2nd round, their experience is lacking in the big playoff games and Boston will have something they don’t heading into the series. Boston will also welcome back Marcus Smart in the later stages of the playoffs and he will no doubt be like a new signing with his defensive and offensive game. It definitely won’t be easy, but I fancy them to go a step further this season. This is where things get a little more interesting as Philadelphia hold the home court advantage over Brooklyn. Philly have remained strong on home court with 31 wins and 10 losses this season while averaging 8 points more than their opponents. Their road form hasn’t been their best going 20-21 on the season but the acquisitions of Jimmy Butler, Tobias Harris and Boban Marjanovic has made this team look incredibly strong on paper. Brooklyn have had a surprisingly great season and have caused many upsets which include wins over Boston, Milwaukee, Philadelphia, Indiana & Toronto, all four teams ahead of them in the East. As mentioned, home court advantage sits in Philly’s favour, but, Brooklyn have won once here earlier in the season and will definitely look to take advantage of Joel Embiid who hasn’t been at 100% for a few weeks. There is no doubt Philly are capable of winning this series, but Brooklyn have been resilient this season and have proven they can cause an upset when D’Angelo Russell leads a full strength lineup. If the squad remains 100% throughout the series, I can see an upset on the cards.